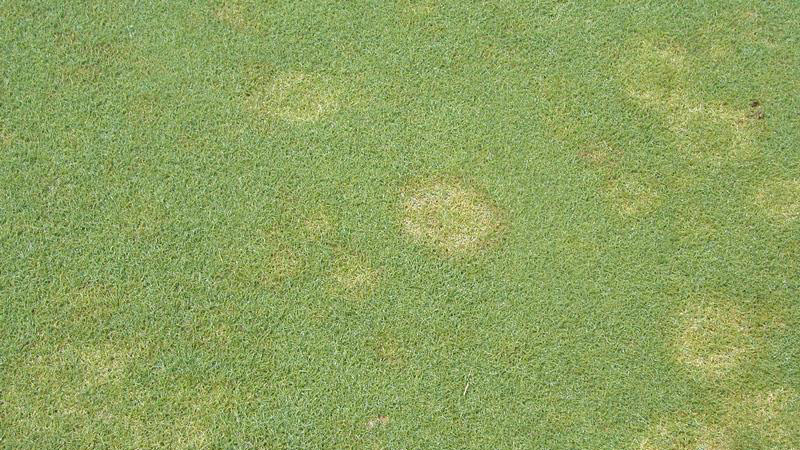 Copper spot is a disease of bentgrass species that develops during periods of warm and humid weather. 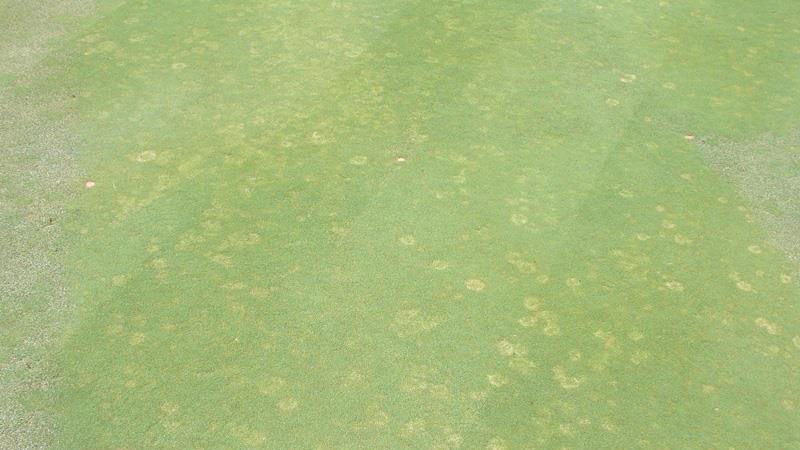 Velvet bentgrass is particularly susceptible to the disease, but it is occasionally observed on creeping bentgrass as well. As the name implies, copper spot appears in small spots, usually less than 3 inches in diameter, that are copper or salmon in color. The disease causes a foliar blight, so distinct lesions or leaf spots are not evident on individual plants. 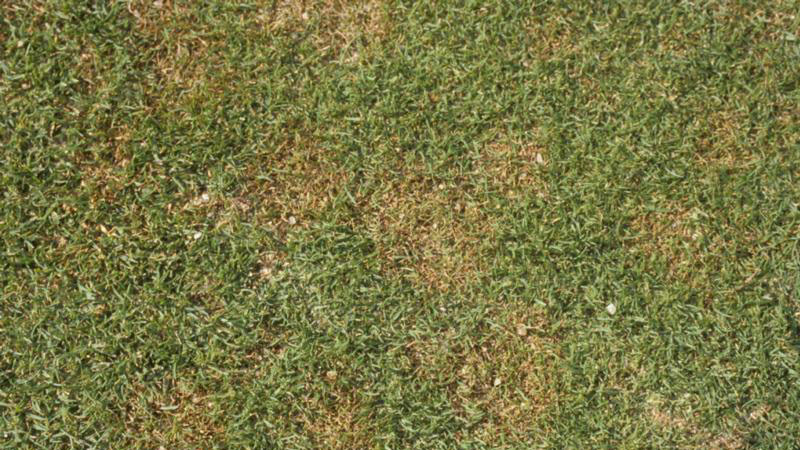 When the turf is wet or humidity is high, the infected leaves may be covered with a thin, gelatinous coating of fungal spores. 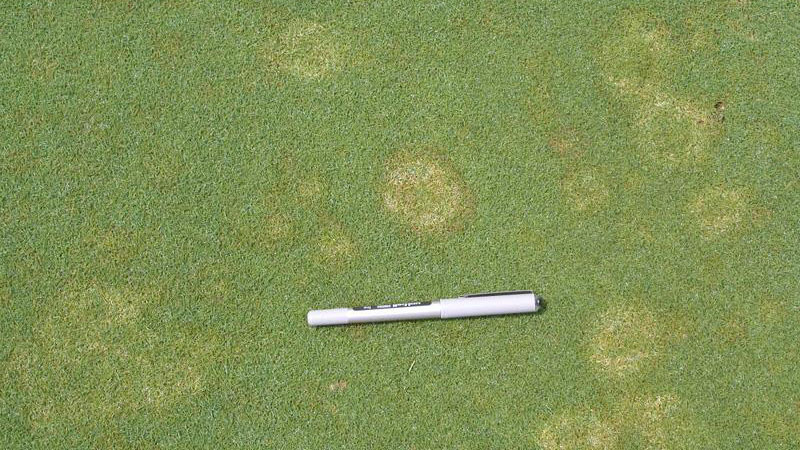 Copper spot develops during periods of warm, wet weather. The pathogen is most active when temperatures are between 65°F and 85°F. High humidity, frequent rainfall, or over-irrigation favors rapid infection and heavy sporulation. 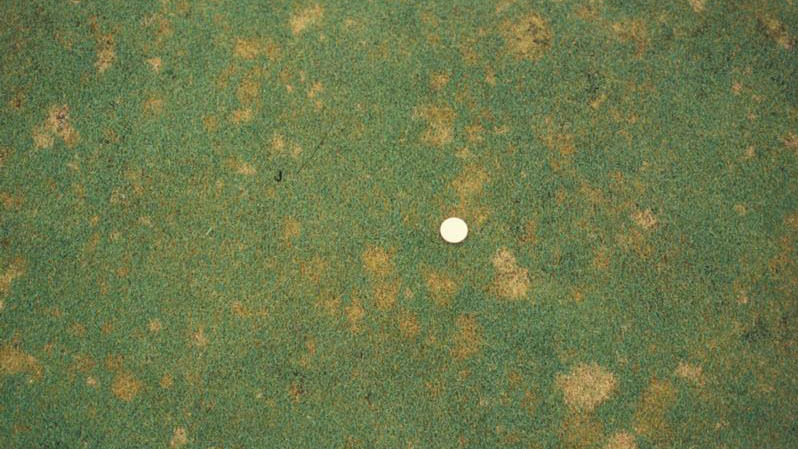 Unlike dollar spot, the development of copper spot is enhanced by excessive nitrogen levels. The disease is also more severe when soil pH is 5.5 or lower. Avoid excessive nitrogen by using granular fertilizers with a blend of quick and slow release forms. In general, no more than 0.25 lb of water-soluble nitrogen should be applied to creeping bentgrass at any one time. Removal of dew in the morning by mowing, whipping, or dragging will shorten leaf wetness periods and discourage copper spot development. Practice deep and infrequent irrigation to minimize periods of leaf wetness. Prune or remove trees surrounding golf course putting greens to increase air movement and sunlight penetration. Installation of high-powered fans will also help to minimize copper spot development in areas where air movement is restricted. Creeping bentgrass performs best when soil pH is between 5.5 and 6.5, but pH should be maintained above 6.0 where annual bluegrass is being cultured. Annual soil testing should be used to determine if lime applications are needed to maintain soil pH in this optimal range. 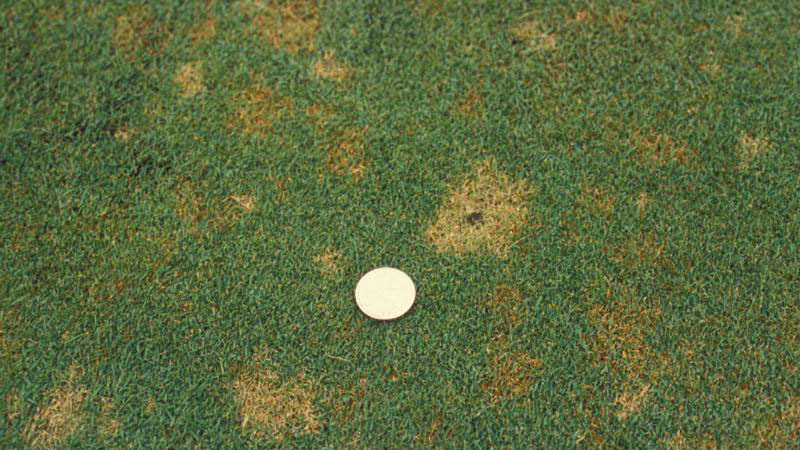 Little is known about the performance of fungicides for copper spot control. 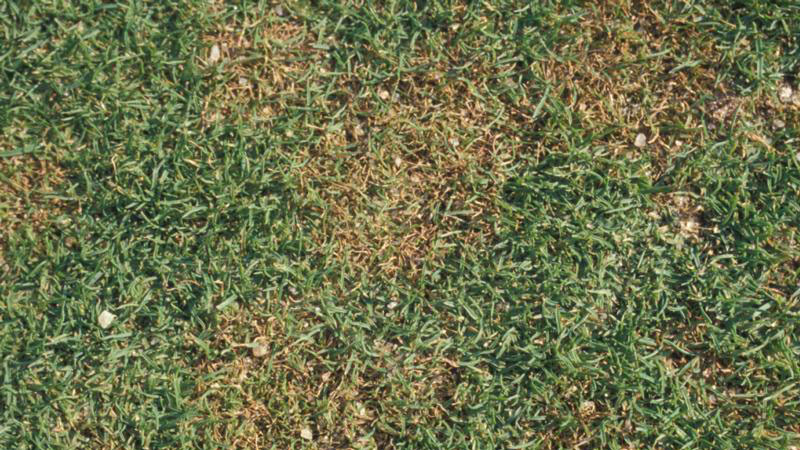 Where the disease has been a persistent problem, apply a labeled fungicide every 14 to 21 days when conditions are conducive to copper spot outbreaks. In other areas, the disease can be controlled curatively if it is detected early. 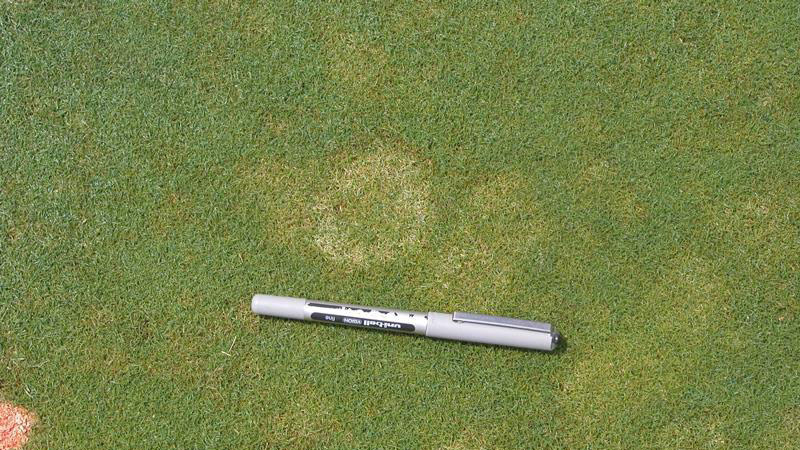 Tank-mixtures of contact and systemic fungicides are most effective after copper spot symptoms appear. chlorothalonil + propiconazole (Concert)* 5.5 to 8.5 14 ++ ? 14 to 21 +++ ? iprodione + thiophanate-methyl (26/36)* 2 to 4 14 to 21 +++ ? triadimefon (Bayleton) 0.5 to 1 15 to 30 +++ ? Figure 1. Copper spot stand symptoms. Figure 2. Copper spot stand symptoms. Figure 3. Copper spot stand symptoms. Figure 4. Copper spot stand symptoms. Figure 5. Copper spot stand symptoms. Figure 6. Copper spot stand symptoms. Figure 7. Copper spot stand symptoms. Figure 8. Copper spot stand symptoms. Figure 9. Copper spot foliar symptoms. Figure 10. 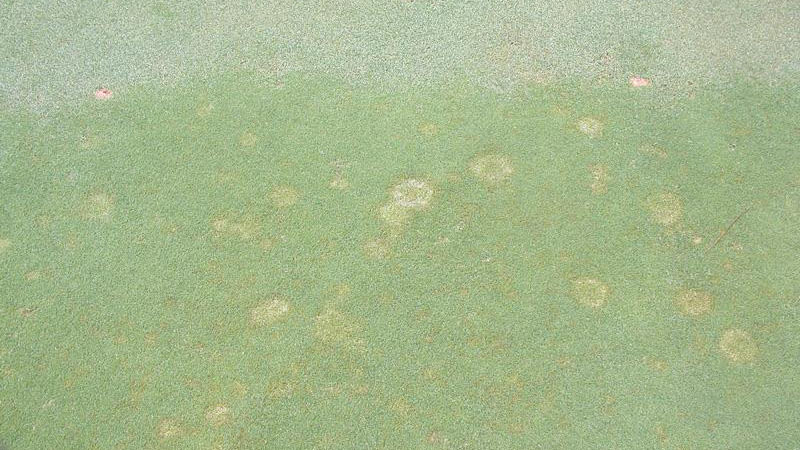 Copper spot foliar symptoms.